Are you an experienced electronics hobbyist, or just getting started? You can fix radios without an engineering degree. 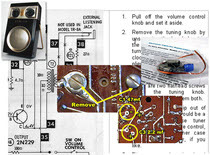 Flipping through radio repair books from the fifties and sixties can make your eyes glaze over and palms sweat. 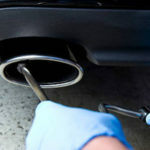 Many car mechanics know how and when to replace the Oxygen Sensor in your vehicle. They need not know the science behind these sensors however. For example, knowing whether or not your car’s sensor is “successively pressurizing and evacuating a sealed chamber between two pieces of ZrO2 using the principle of oxygen ion pumping” is not critical to getting the Check Engine light to extinguish. The tech only needs to do methodical troubleshooting (measure emissions and read the engine’s codes using test equipment), and then make a successful replacement. 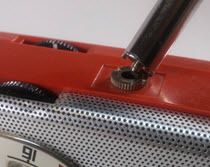 It can be so with transistor radio repair as well. While it might be interesting and informative to understand Ohms Law, you can solve many common radio issues without knowing the meaning of I=E/R or any of its variants. Knowing these things, of course might make troubleshooting easier, especially for complex problems, but other times, thinking like an engineer can be a distraction. Like the technician, you can often search for clues, isolate faults and make the radio play again without knowing much math, if any. And then later, if the spirit moves you, there is plenty of radio science to explore at your leisure. Broadcast radio waves from radio stations, (also known as RF signals), bombard the radio’s antenna. In the United States these Amplitude Modulated (AM) signals cover a frequency range of 540 to 1600 kHz. The resulting, tiny RF signal is boosted by one or more RF amplifiers, which also help further reject unwanted interference. Many radio designs include Intermediate Frequency, (aka IF stages) to further boost and clean-up the signal. The Mixer stage converts the incoming radio’s signal to something easier to amplify. At this point, however, the stronger signals, be they RF or IF, are still above the range of human hearing. A detector stage converts the RF or IF signals to audio signals, which are passed through the volume control, and then amplified further by audio amplifiers before being sent to the speaker or earphone. 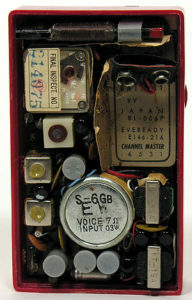 The audio amplifier often works with Automatic Gain Control (AGC) circuitry which attempt to keep the volume consistent. (These are sometimes called Automatic Volume Controls (AVC).